Your backyard swimming pool gives you and your family hours of enjoyment almost all-year around, making your yard the hub of outdoor fun. But when your fiberglass pool starts showing its age with cracks, blisters and leaks, you need a professional to give it a second life. At Texas Fiberglass Pools Inc. we’ve dedicated our business to becoming the fiberglass pool authority in Abilene, Texas. Many other companies that claim to do fiberglass repair and remodeling are primarily in the business of manufacturing and installing pools. At Texas Fiberglass Pools Inc. we’re focused on being THE experts when it comes to remodeling and repairing fiberglass pools and we don’t even distract ourselves with new pool installations or routine maintenance tasks. Our goal is to take the backyard water environment you have and give it a makeover, whether your pool or spa need repairs, a minor facelift or a complete renovation and facelift. We also repair and renovate fountains, decks, patios and baptisteries. No matter what kind of repair you need, whether it’s due to age, cracks, blistering or leaks, turn to Texas Fiberglass Pools Inc. for expert, efficient service. Our leak detection specialists and pool resurfacing professionals are among the top tradesmen in the business. They’re part of our elite renovations team, who are experts at bringing new life to pools, spas, decks, patios, bridges, fountains and waterfalls. Our warranties are among the longest in the industry and we insist on perfection in everything we do. Although fiberglass pools have a lifespan of 20 to 40 years with few needed repairs, things can and do go wrong, through no fault of your own. Our Abilene, Texas pool crack repair and resurfacing specialists will make your pool and deck look like new again. As one of the area’s top fiberglass pool repair and resurfacing specialists, we will help you reinvent the pool, spa, fountain, deck and yard you already have in place. We even handle commercial accounts. Do You Need Fiberglass Pool Resurfacing in Abilene? 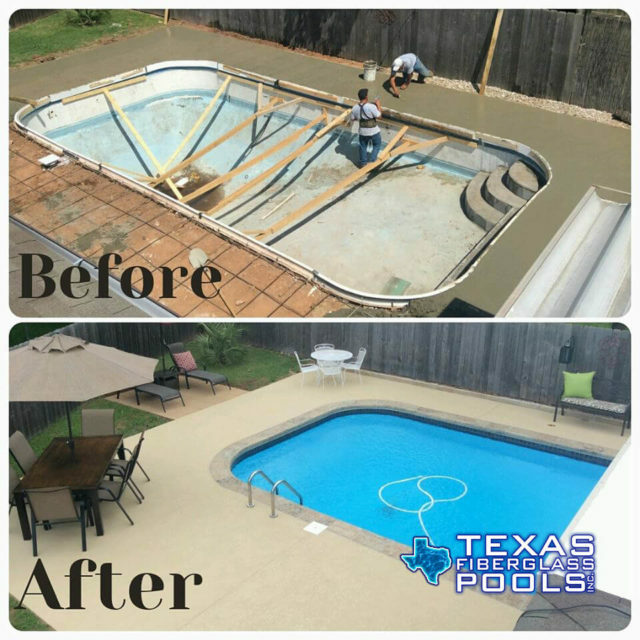 Call the pool masters at Texas Fiberglass Pools Inc. when your residential or commercial pool needs resurfacing in Abilene. Our repair and renovations team will assess your situation and make recommendations based on your desired goals and budget. You can tell it’s time for resurfacing when problems start surfacing. You might see cracks, bubbles and blisters or notice discoloration, roughness or water levels decreasing. These are all signs that it might be time for resurfacing. Spider cracks are hairline crevices that occur in the surface layer, or gelcoat, of fiberglass. They are not structural in nature—the crack is normally only through the thin layer of gelcoat and does not typically extend into the structural laminate layers of the pool. These cracks typically only affect an area of the pool that exceeds the ability of the gelcoat to flex. But these rifts are unsightly, and aesthetics alone, important for real estate value, is reason enough to consider resurfacing. As time marches on, signs of wear and tear mount and resurfacing a pool becomes important for many reasons beyond aesthetics. Extensive and continuous cracks could be signs of a leak that will only get worse over time. Fiberglass pool resurfacing is also important for improving pool cleanliness and ensuring health and safety. If your pool has cracks or you think it might be time to have your pool resurfaced, call the experts at Texas Fiberglass Pools Inc. We have decades of experience in fiberglass pool resurfacing in Abilene. If your pool is on the older side or it no longer suits your family’s needs, don’t think you have to scrap it and get a brand new one. At Texas Fiberglass Pools Inc. we’re experts when it comes to reinventing your old pool with a new vision. Fiberglass pool remodeling can change the way you feel about your backyard. We can remodel your old pool to fit your current lifestyle and add any number of impressive new features. Swimming pool restoration and renovation can include custom lighting and rock features; spas and waterfalls; outdoor kitchens and barbeque pits; and so much more. There’s no limit to the extent of what we can do. We’ll work with your imagination and budget. Giving your pool the right kind of facelift can mean the difference between an ordinary backyard and your own private resort. We work with you to imagine the yard of your dreams and come up with a fiberglass pool remodeling plan that works for you on every level. Do You Need Pool Leak Detection in Abilene, TX? Our leak detection team will first isolate your pool’s plumbing from the other plumbing in your home. We’ll perform a computerized analysis of your water loss—including the rate water is leaving your pool—taking normal evaporation into consideration. Pumps, filters, heater, chlorinators and automatic control systems will carefully be inspected, especially if the water level is lower when the pump is on. We use sound sensors, new technology that can actually hear leaks, since leaks can also come from cracks in the pool’s surface or the ground around the pool. Your pool will also be pressure tested since water pressure at the bottom of the pool can cause cracks to expand quickly. We use diving equipment to inspect underwater drains and other features that might cause leakage. Our diver will also conduct a dye test underwater and inspect cracked tiles, broken grout, lights and fixtures at the bottom of the pool. The expert technicians at Texas Fiberglass Pools Inc. can often make underwater repairs without draining the pool. A crack in your fiberglass pool doesn’t always mean a leak, but cracks usually warrant a further investigation. Gelcoat spider cracks in fiberglass pools are usually the result of pressure on a given point of the pool shell that exceeds its ability to flex. Gelcoat cracks are almost always harmless but aesthetics alone usually prompt the repair on these kind of cracks. The technicians at Texas Fiberglass Pools Inc. will assess the crack and determine if it needs further investigation or a quick remedy. Usually the solution for fiberglass pool crack repair is to grind out those cracks and fill them in with a new layer of gelcoat. Older fiberglass pools occasionally see blistering, especially in shells over 20 years old. These blisters often will be grind to release the moisture. After that, a vinyl ester resin is applied to provide a water barrier, then gelcoat will be applied to finish the job. Are You Looking For Pool Plumbing Repair in Abilene? Pool plumbing can fail or leak for a number of reasons, from settling due the type of backfill material used when the pool was installed, to the age and maintenance of the pool system equipment. Pool leaks come in many forms, from the small, hard-to-find drip, to the large, can’t miss gusher. Unless water is dripping onto the motor, or causing particular problems, a slow drip on a plumbing fitting or from the pump won’t cause noticeable water loss in the pool. Suction side leaks. These are leaks from the skimmer and main drain suction pipes, fittings and valves. Pressure side leaks. Glue joints or threaded joints can leak, where PVC male and female connections are made. Underground leaks. Although not typically the cause of pool leaks, pipes can break from freeze damage, tree roots, and from settling decks or shifting soils. Flagstone is among the most beautiful and durable choices for patios, walkways and pool decks. No two slabs of flagstone look exactly the same, with each having its own color, shape, and markings. Other great aspects about flagstone patios, especially near a pool area, is that flagstone is extremely water and heat resistant, which is perfect for wet feet in the hot summer. Flagstone is also eco-friendly—it is made from natural stone, requires little to no maintenance and lasts practically forever. If your baptistery has seen better days or has cracks or, worse, leaks, it’s time to call in the experts at Texas Fiberglass Pools Inc. Older or poorly maintained baptismal pool tubs can lead to water contamination and drainage problems in your church building. Resurfacing your Abilene, TX baptistery with fiberglass will ensure it is highly resistant to corrosion, staining and etching and can also make it look like new again. Our trained craftsmen can help you bring your baptism pool ideas to life or take it back to the beauty of its origins. Pools constructed of ground gunite, concrete, or block and fiberglass walled with concrete bottoms can benefit from fiberglass pool resurfacing. Using paint or concrete for your repair or renovation is cheaper but will cost you in the long run with extensive maintenance and quicker replacement times.Compared to other resurfacing materials, the fiberglass pool resurfacing we offer at Texas Fiberglass Pools Inc. will last for many years longer than any other material and require significantly less maintenance.The fiberglass process is so much stronger than a conventional surface. It lasts 20 to 40 years and won’t crack like concrete, wrinkle and tear like liners, or rust and leak like steel walls. Fiberglass pool repair provides an impervious seal for any kind of pool leak. The fiberglass process provides a strong, long lasting, watertight surface that bonds easily to concrete and steel and yet remains flexible to structural movement. The strength comes from bonding a fiberglass mat between four layers of top quality resin. We resurface existing pools made of gunite, fiberglass, vinyl or a “combination” (a combination pool is made with either fiberglass walls or metal walls and a concrete bottom) with new fiberglass. Gunite pool crack repair is no challenge for our experts. We have yet to meet a pool we cannot renovate and remodel. Call Texas Fiberglass Pools Inc. today for a no-obligation consultation and estimate. At Texas Fiberglass Pools Inc. we are focused on one thing: your complete satisfaction. We are the industry experts in Abilene when it comes to fiberglass pool repair and remodeling and handle all types of leak detection, crack repairs and resurfacing for homes and businesses. We can turn your aging fiberglass, concrete or vinyl pool into the pool you’ve always wanted. We’re different not only because of our approach, materials and equipment but also thanks to our highly trained craftsmen and crew.